The general muffin rule (applies to any type of quick bread) is that once the wet ingredients meet the dry ingredients, you need to get that batter into the oven quickly to take full advantage of its rising power. Fill the lined muffin tins according to the directions but instead of baking, pop them into the freezer—pans and all! Once frozen hard, transfer them to a freezer bag or container; write the baking temperature on the bag so you don’t have to search for the recipe again later. Now in the morning place the frozen muffins back in the muffin pans and pop them into a preheated oven, increasing the baking time by only 5 or 6 minutes. You can bake all the muffins at once or one to two at a time in a toaster oven. Tip: Make up several batches on the weekend and you’ll be set for the whole week! Frozen muffin batter will last in the freezer for up to two months. 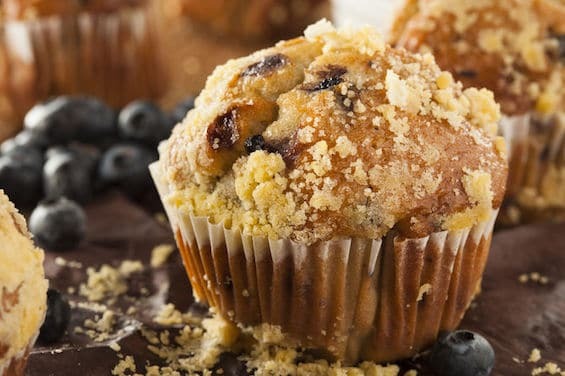 And now for your muffin-baking pleasure, here are my family’s absolute favorite muffin recipes. When fresh blueberries are in season—or frozen berries are on sale—I can make these for less than $.25 each. Preheat oven to 400 F (200 C). Grease muffin cups or line with muffin liners. Combine 1 1/2 cups flour, 3/4 cup sugar, salt, and baking powder. Place vegetable oil into a 1 cup measuring cup; add the egg and enough milk to fill the cup. Mix this with flour mixture. Fold in blueberries. Fill muffin cups right to the top, and sprinkle with crumb topping mixture. To make Crumb Topping: Mix together 1/2 cup sugar, 1/3 cup flour, 1/4 cup butter, and 1 1/2 teaspoons cinnamon. Mix with a fork, and sprinkle over muffins. Preheat oven to 375 F (190 C). Line muffin pan with muffin papers. In a large bowl, mix together 1 1/2 cups flour, baking soda, baking powder, and salt. In another bowl, beat together bananas, sugar, egg and melted butter. Stir the banana mixture into the flour mixture just until moistened. Spoon batter into prepared muffin cups. In a large Ziploc bag, mash the bananas. Add the eggs, seal the bag, and shake and squish until combined. Add the sugar and mix well. Dump in the flour, salt, baking soda, baking powder, and cinnamon. Before zipping and mixing them all the way in, mix them together a little with your measuring spoon. Now add the oil (I know it’s not standard to add the oil last, but that’s the only way I can use the same measuring cup since all the other ingredients you have to measure are dry; It works anyway) and vanilla and shake and squish until well combined. Snip the corner of the bag and squeeze the batter into a lined muffin cup. Don’t make the hole very big at all because the batter is very runny. Pinch the corner between each muffin. 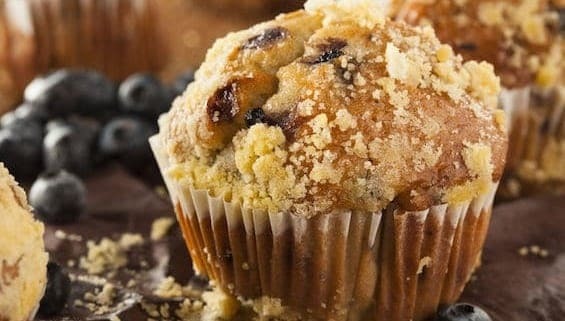 Right before serving (do not add this to your muffins before freezing, if you choose to use that method) make the glaze: Mix together the powdered sugar and liquid and spread over cooled muffins.